Happy New Year! I salute all of you whohave walked the warrior path for another year. The world is a better,safer place because of you! As we know, the world is not really a safeplace for many—too many—of our fellow human beings. Warriors aresorely needed today. Gambatte! As in other years, I had the privilege oftraining with many Buyῡ from around the world. I visited Germany, California, Florida, andChicagoland—some more than once. There was also a mini-reunion inAtlanta with Bud Malmstrom, Stephen Hayes and a bunch of folks from the"old days." It was a pleasure to see all of you and hear aboutyour lives. This past summer also saw the ninth annual BuyῡCamp in San Francisco under the Golden Gate Bridge on the Pacific Ocean. And a third Buyῡ Camp East in New Jersey. Buyῡ Camps are a great way to connect with old friends and get that "continuing education" and inspiration that will help you "keep going" when you get back to your own, local training group. See you there again in 2007! I was in Japan for the Daikomyosai—Hatsumi Sensei's annual training / birthday party. I know I say this every year, but, Sensei is more genki than ever. One of the things that differentiates our art is the fact that it can bepracticed at any age. And if Sensei is an indication, consistent practiceactually makes you younger. Funny, that wasn't a real consideration for meuntil recently. Another seminar that has become an annual event is the "Life Values Workshop." This is a seminar where we practice our Budo in the context of Robert L. Humphrey's Life Values teachings. Many people have expressed interest in the STRIKE training that Humphrey devised to help Marines overcome the stress of real combat. If you want to experience it, we'll see you next July in New Jersey. And, it looks like I will be doing even moretraveling next year. Please consult the WIN seminar page periodically for detailsof all of our workshops. 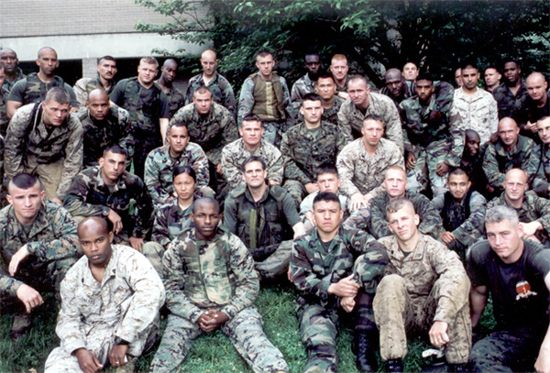 Some of the most rewarding work I did, again, in2006 waswith the Marine Corps Martial Arts Program (MCMAP). This is a fine program that covers the martial arts techniques that a Marineneeds to walk the warrior path—both in combat and around town. But, themost important aspect of the program, in my opinion, is the "EthicalWarrior" training. The program is designed to "clarify, activateand sustain the Warrior Ethic." I think we all need to talk less and train more. That includes diet and exercise. In his book "The Way of the Ninja," Hatsumi Sensei wrote: "The first step in Ninpo training is that of physical endurance." Let's challenge ourselves with this simple thought: "Will we be as healthy and full of energy and happiness as our teacher is when we are his age?" It is time for us to embrace his example. 2. Clarifying the Essence of Warriorship. I believe it is important to continue to reflect seriously on the meaning of our warrior vocation. 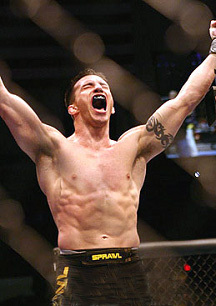 I constantly speak with people who seek a better understanding about the difference between sport martial arts and combat martial arts, and between self-defense and warriorship. In combat, people "play" by their own rules—if any! In combat, the mission almost always revolves, not around fighting for yourself, but around fighting for others—whether it is your country, your community, your family, or the guy next to you. In other words, warriorship. The fellow on the left is participating in one of the exciting Mixed Martial Arts competitions. Very cool! For him. The fellow on the right took his helmet off in a combat zone so a little kid could try it on. The Marine's name? Lance Corporal Tyler Troyer. I spoke to his stepfather this year. It was pretty emotional. You see, Tyler was killed by a sniper near Al Karmah, Iraq last year protecting that kid's village and others like it. As the Marines like to say: "No better friend, no worse enemy." 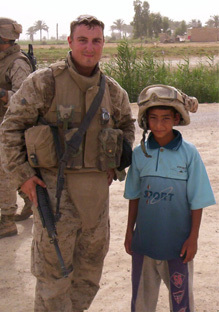 LCpl Troyer, along with the other Marines with whom he served, was "no better friend" to the citizens of Iraq. One of the challenges I think that we all have is to continually deepen our understanding of the Warrior Ethic and how to live it. Let's face it, we live in a particularly self-absorbed society, many of us. It is easy to get caught up in the selfishness. And I don't mean just material selfishness, but selfishness of the spirit. If we are truly honest, there isn't hardly one of us who hasn't fantasized about “trying out” our martial skills, perhaps in competition, perhaps out in town against some "bad guy." The former is not really a problem, and is actually a quite natural manifestation of the competitive spirit. But we need to be clear: sport fighting is not warriorship. In my opinion, sport fighters fight for themselves; warriors fight to protect others. What about self defense? Can the skills of the warrior be used to defend oneself? Absolutely...and also to cut a prime rib of beef. But even self defense is not warriorship in my opinion. The role of the Ethical Warrior is to protect life. Whose life? Self and others'. Which others? All others, if we can. Even our enemies (as the Marines are often called upon to do), if we can. Those who believe that being a protector is somehow less “combat effective” than being a “tough guy” can be asked whether they would rather face a (killer) grizzly bear or the (protector) grizzly bear with cubs. The concept of protecting others, especially those not of our “in-group,” is a difficult one for many of us. Especially in our world today. To risk our lives for others, even strangers, even our enemies, is very anti-intuitive. But there is a great measure of satisfaction in a life lived according to the precept of protecting others. Dr. Humphrey, when asked near the end of his life to describe his proudest achievement told a surprising story about an incident that occurred on Iwo Jima with a Japanese prisoner. Most Marines know the story of Iwo Jima. One of the “dirty little secrets” of that battle was that the Japanese did not believe in taking prisoners, as surrendering—even when wounded—was considered a violation of the warrior code of Bushido. [This is an over-simplification and skewing of the true Bushido concept, by the way; and this fact is just another example of how a relative value can “misfire” and become rationalized and disconnected from the Life Value. - JH] Unfortunately, some Marines began to follow suit with the killing of wounded or surrendering Japanese soldiers. Why protect others? Especially our enemies!? Because it is a species preserving (moral) act—even if the individual(s) in question don't seem to deserve it. Being a “warrior-protector” also provides great personal satisfaction and a feeling of “nobility.” It creates a "better life" for the protector. If the role of a warrior is protecting life, then when do you take a life? Let's not be naive. Warriorship may involve killing. But the Ethical Warrior takes life only when he has to in order to save life. And when killing is necessary, it is to be done as quickly and humanely as possible. The warrior is the only human archetype called upon to make a split-second kill-or-protect judgment. This grave responsibility is entrusted to the warrior because he risks his life to protect others. The Warrior Ethic bids us to protect others. Human nature bids us to protect our loved ones and families—before ourselves. There is an old saying: “You always hurt the ones you love;” and we know that after a difficult day it is common to bring the stress and craziness of the outside world home with us. But the Ethical Warrior recognizes that his job as Warrior Knight is not done when he comes “home from the wars.” Rather, job #1 is just starting. That is, to protect and defend the ones he or she loves the most. In that regard, I encourage you to adopt the third admonition of the Warrior Creed: “Whenever I return home, everyone is glad.” In many ways, living this credo is the most difficult. But if we can, it is a better life. This simple admonition may go a long way toward decreasing domestic problems in our world and creating a happier life for our loved ones—and us! In 2006 we worked through severalthemes, Hatsumi Sensei taught Shinden Fudo Ryu; and we were able to see readily that this ancient art still holds many lessons—particularly for those of us who use weapons and wear body armor. Another theme was nature, which we in the Buyῡ mirrored in our own training. How did we do with that? 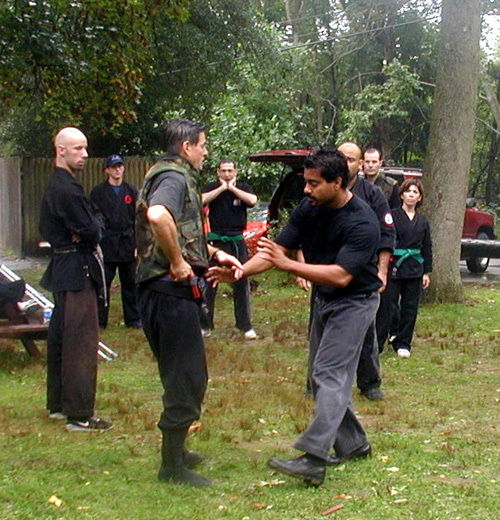 Modern Shinden Fudo Ryu training at Buyῡ Camp East — in "nature" (also known as in "the pouring rain"). Sensei also spoke about some rather sublime concepts in 2007 in connection with Shinden Fudo Ryu. It is not important, I think, to be able to understand these concepts literally and completely. Rather, think about them; savor them; try to grasp the feeling of them. Hmmm....plenty of food for thought during our next 25 years of training, neh? Next year it appears that we will be focusing on Kukishin Ryu, which follows nicely from the 2006 year theme. I predict more training in battlefield-type conditions, with armor and weapons. Dust off those rokushaku bo while you're at it! So, with Kukishin Ryu as our perspective this year, let us make Ethical Warriorship our Buyῡtheme for 2007. Hatsumi Sensei's shodo - "Kuki Taisho"
Hatsumi Sensei wrote that Shinobino ho, or Ninja methods, are "for discerning what is right forthe world, enduring, training to become a moral being, becoming aware of one'sdestiny, and dedicating one's life to other people or the world as awhole." Let's train consistently and thinkdeeply. And let's enjoy! Good luck in 2007, my Buyῡ. Keep going!